On March 28, 2019, the U.S. Department of Labor (DOL) announced another proposed rule to update regulations under the Fair Labor Standards Act (FLSA). The proposed rule would amend 29 CFR part 778 to revise the “regular rate” requirements under section 7(e) of the FLSA, 29 U.S.C. § 207(e). Most bonuses will still need to be included in the overtime rate calculation. However, the DOL’s proposed rule attempts to elaborate on the types of bonuses that are and are not discretionary (and therefore, excludable) -- hopefully offering a little more clarity for employers. The Notice of Proposed Rulemaking was published on March 29, 2019, and the agency is accepting public comments through May 28, 2019. 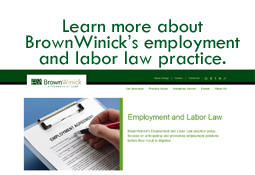 If you have any questions about the DOL's proposal, or other wage and hour questions, please contact Megan Moritz (moritz@brownwinick.com) or another member of the BrownWinick Employment Practice Group.